Fun facts: The ancestor of modern cultivated beets is called the sea beet and it prospered all along the coast of the Mediterranean Sea. This ancient food was eaten widely and archaeologists have uncovered remains in Egypt dated to 2600BC. The remains of this ancient plant are still evident in the crop grown commercially today where farmers are required to feed the plant with boron, an element found in coastal soil. Preheat oven to 180°C. Peel and dice beetroot into 1½ cm pieces. Cut red onion into 1 cm slices. Combine diced beetroot, sliced red onion and whole garlic cloves on a lined baking tray with a drizzle of olive oil. Season with salt and pepper. Add to the oven, set timer for 15 minutes. Remove chicken from refrigerator, pat dry with paper towel and season both sides with salt. Heat olive oil in a large pan over medium-high heat. When oil is shimmering, add the chicken, skin side down and sear until skin is golden, about 4 minutes. Remove chicken from pan. (Note: the chicken does not need to be cooked through at this point). After 15 minutes of the vegetables roasting, add seared chicken, skin side up, to the same baking tray. Roast for about 10 minutes, until the chicken is cooked through. Set aside to cool. If desired, add the beetroot back to the oven to roast for 5 minutes longer. 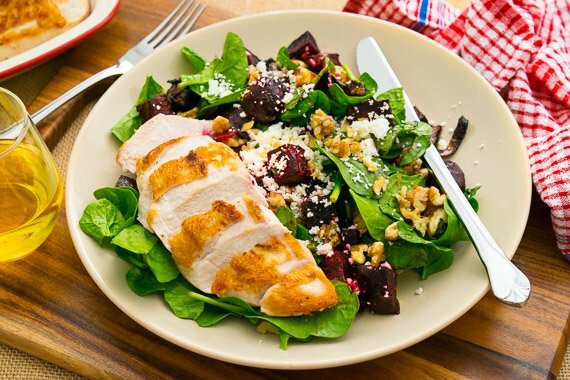 Slice the roasted chicken and divide salad between plates. Season to taste. Enjoy!